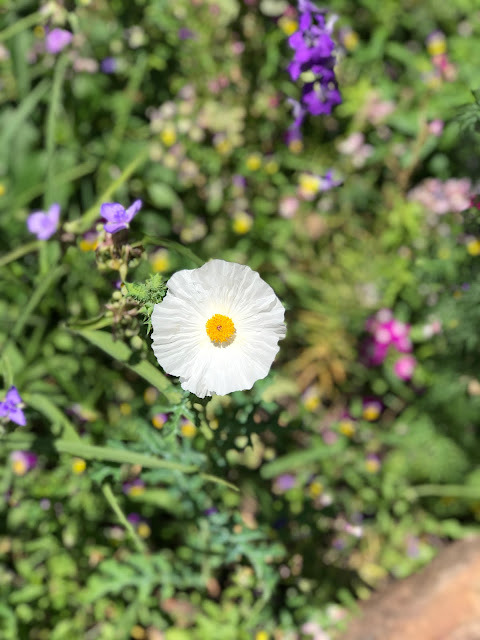 In the interests of full disclosure, the Head Gardener insists that I tell you the above pictures were actually taken on Saturday, September 5th, and not this sultry Labor Day. Whatever! We were busy out there on Saturday and it was truly a day of labor, therefore I say it qualifies. As much as I enjoyed seeing the Blackie sweet potato vine spilling over and around the borders by the garage wall in back, I was growing ever more concerned that their rampant growth was negatively affecting other plants. Much to my chagrin, I was right: I lost several Peachie's Pick Stokesias in that area. My theory is that they do not like being overgrown by other plants and vented their displeasure by rotting where they were planted. The Stokes' Asters were such stellar performers in the spring that I am most upset with the Head Gardener for allowing the Blackies to run amok. So those pools of dark purple in the photographs above are the SPVs that were unceremoniously yanked and consigned to compost. 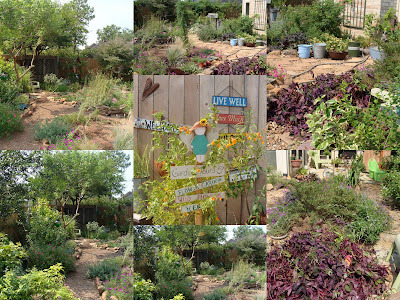 The center photograph shows the fence outside the garden gate: the Live Well, Laugh Often, Love Much sign was a gift from my baby girl and the Garden Tours sign is something my boy found when he was gallivanting around Louisiana with friends. They're pretty special (the kids AND the signs). So today the Head Gardener did battle with weeds in the rose and daylilies beds. A very helpful lawn crew came by at my request last week and cut new edges on my front beds, taking out a good foot of grass along the length of those beds. I'm happy with how that looks, especially now that most of the weeds and some of the manky zinnias have been dispensed with. Much as the Head Gardener and I hate to yank zinnias, since they're such butterfly magnets, we're at the point where we've got to clear some of them out. There are still quite a few left and we have no fear of there being no zinnias sprouting next season. In fact, any of y'all who want Alleyway Mix Zinnia seeds, let me know. I hate throwing away all those potential plants and would be delighted to share them. For those who are wondering, we did get some rain last night but you could barely tell in most areas. We shall not complain, we shall soldier on, we shall be valiant and stout of heart. Maybe. HOWEVER ... the Head Gardener wishes me to report that the following words neither of us ever thought to hear ourselves utter, to wit: we were excited to see that the first Oxalis of fall unfurled a leaf this week! This would be the weed version of Oxalis, which my chere amie Amy felt should be investigated as an alternative fuel source, given how plentiful it is in our area throughout fall and winter. Mind you, the HG and I did not allow said Oxalis to remain in the ground. It was consigned not to compost but to the rubbish bin. Why, might you ask, if we hate Oxalis that much, are the HG and I celebrating its arrival? Good grief, people, do we have to spell it out for you? It's a fall weed! That means that fall is really and truly on its way. 23 days till October 1st! You and this mysterious Head Gardener have been very busy getting the garden under control, waiting for fall. It's almost here, some of our leaves are actually starting to turn up north here! You have been laboring on this Labor Day weekend! Sounds like you've gotten a lot done. Austin got rain Fri/Sat but our house got NONE! There was a tiny circle of dry, and we were smack dab in the middle of it. This has GOT to end! Yay for Fall! Let the countdown begin! Cindy, You have been a busy gardener! The sweet potato vine is a beauty, but you won't miss it! I am sorry to hear you lost Peachie's Pick x2 to its smothering behavior. Here they need moisture with very sharp drainage or they decline. Talk about a diva. I would love to have a few Katy zinnia seeds for C and L! Thanks for the offer! Have a sweet week! I've discovered that other plants also do not take kindly to being smothered. Poor Peachies! I love your garden signs! I need some for my too plain fence. I'm happy to see fall coming too. It's a great season. Love the garden signs (kids can be so great!). I love sweet pot vine, but it does go over the top a bit..but love the color. Yep--I can almost feel it in the air (well, almost)--fall will be here before we know it. Hooray!!! I've had the same frustrations lately about the sad state of plants jammed into pots by the growers. I think that's why my buddleia is not very big. Too bad about your abutilon. The one I tried this year is doing pretty good I'm happy to say! Pulling up zinnias?? Oh my, that's heresy here:) I'm glad that fall is on its way for you, though I'm hoping it doesn't mean an early frost up here. Cindy, although very late with a comment, I do enjoy your posts! Sounds as though you have been good gardeners and preparing for fall. Let's hope that fall means more rain a more moderate temps. Zinnia seeds, would love some. Yo will have to get in on Monica's seed exchange. It's a lot of fun and I got some great seed last year.